"GOOD TO GO 'TIL TEN BELOW": Feb. 2 -- Groundhog Day!! Awfully cold this morning, but the weather report has us to a balmy 36 degrees on Saturday. Because of the snow predicted for this week we decided on a run from the Lakeshore Towers. Start at 7 AM as usual. Perhaps you saw the article in the Journal Times about our goofy runners, local section on Monday. Bill may be able to supply the link. I’ll do better than just posting the link…I’ll post the whole article here! Some might think one would be a little goofy to run 13 miles one day and 26 the very next day. But that is just what six Racine-area runners did the weekend of Jan. 12-13 at the Walt Disney World Marathon in Orlando, Fla. The Goofy Challenge is put forth to runners who want to try running both a marathon (26 miles) and a half marathon (13 miles) on consecutive days. For their accomplishments, they received gold medallions, including one shaped in the likeness of the Disney character Goofy, and a huge sense of pride and accomplishment. The participating local runners were Jodie Bochinski, Bill Folk, Kristin and Rich Fritz, Andy Hay and Melissa Northrup. All are members of the Saturday Morning Running Group, which meets at 7 a.m. every Saturday at various Racine-area coffee shops. A close friendship has developed out of that Saturday morning group for the six who went to Orlando and their spouses. The idea to go was Folk’s, who said he has a goal of running a marathon in every state of the union. Northrop is a veteran of the Walt Disney WorldMarathon. The idea to do the Goofy Challenge component emerged out of the competitiveness that the friends share. “Well, if you do it, I’ll do it,” is how Folk described the decision to do both races. With the decision made, the group had to act fast to meet the registration deadline for the Marathon. That was last February. “It was about 98 percent full by the time we registered,” said Northrop, 31. “It seemed so far away when we registered. It was like ‘Will the day ever come?’ ” said Kristen Fritz, 43. But the wait was worth it. The organization that only a huge hospitality corporation like Disney can provide made for a truly a magical experience, Northrop said. Some examples of the services provided to the runners included bus transportation between hotels and the starting point for the race, and musical entertainment at nearly every half mile along the race route, including a full choir near the finishing point, said Fritz. Hay, 39, said another innovation was electronic message boards throughout the course that flashed words of encouragement and inspiration. The course of the marathon meanders through the four separate theme parks that comprise Walt Disney World — the Magic Kingdom, Epcot, the Animal Kingdom and Disney’s Hollywood Studios — and the expansive grounds and parking areas in between. Race day provided an early-morning challenge for the Racine runners. It meant rising at 3 a.m. on both the Saturday and Sunday in order to get to the starting point and to register for the 6 a.m. start time. There were nearly 16,000 runners for the half marathon and 18,000 for the full marathon. But the early start also meant being able to avoid some of the Florida heat, not that the Racine runners aren’t used to hot and humid conditions. A couple have raced in marathons in St. Louis and a couple even began in the infamous Chicago marathon of last fall that was called after runners started collapsing en masse. 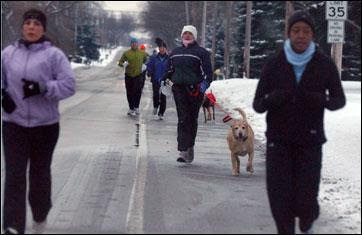 Running a marathon takes anywhere between four and six hours for experienced runners, members of the group said. To get an idea of the distance, they said think in terms of running along the interstate from Highway 20 to Gurnee Mills. And generally it takes a while to recover after running a marathon, which makes the accomplishment of the Goofy Challenge all the more impressive. The total number of marathons the six Racine runners have completed varies. Fritz has run five, Bochinski has completed six, while Folk has finished nine. As for the 50-state goal, next on the group’s joint marathon adventure is Maui, Hawaii, in 2009.